I finally got round to making and fixing the brackets, and buying the bungee cords to secure the fridge and cooker. 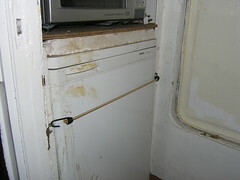 The bungee cords should stop the doors from swinging open, or the appliances from sliding about in any kind of swell. A relatively trivial task in the scale of things, I know, but nevertheless important. By the way, that's paint or something which has dripped on the fridge, as the fridge ain't coming out of there in a hurry, not dirt. I have power, plenty of power. This has had an immediate beneficial impact. Never have I achieved such a classy finish on anything I've ever painted (Click on the picture for a bigger image to see what I mean). So far, all the painting I've done on Lady Jane has been by brush, or roller. At one point, in a fit of enthusiasm, I bought a spray gun, but have never used it. Most of the reason for not using the spray gun has been on account of power issues. My small generator is a little too weak to run a compressor, whereas that poor donkey engine does itself no favours with all that noise. I've also never used a spray gun, so have been hesitant about getting stuck in with it. You know the sort of thinking where you have something that works, so don't want to try pushing the envelope with something new for fear of failure. It must be said that it took quite some time to make any headway, but I'm extremely pleased with the results so far. 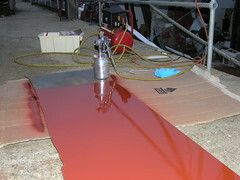 The picture of the glass like paint job was taken while spraying, and before the paint dried. 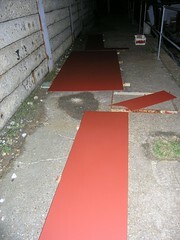 It's hard to say if, overall, spray painting is quicker than using a roller. But the results so far seem to indicate that any extra time, or effort, may well be worth it. Sadly, the primer dries to a matt finish, but I'm enormously encouraged by the results so far. I'm also excited by the possibilities for the future. After the debacle of the Chinese made generator back in May 2006, it has been on my mind to get a new, modern, silent running diesel generator. A proper one though, none of that cheap junk for me again. It is very noisy, especially for work anywhere inside the boat. It is an absolute beast to start when cold. I want to save the donkey engine as much as possible for boat duties. 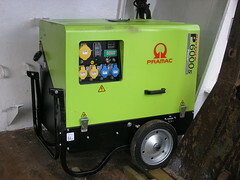 So now I've finally swung that new generator on board. So far it seems to run quietly enough, and is capable of producing enough power for pretty much everything I'll need in the foreseeable future, including welding. I'll wait until it's properly run in (the Chinese one did not even make it that far) before I take the wheels off, and mount it permanently in it's allotted place, up forwards. "Steel rusts, and rust never sleeps. From the moment you get a steel boat until the day they cart you away, you're going to be dealing with rust. Rust is a simple process. All it requires is some steel, some water, and time. Add a little salt and it doesn't take so much time. Add some electrical current to the salt and water, and the steel melts like a snow cone on hot pavement. In the past, when I've had new steel delivered, it has simply been left as delivered, then as the steel has been used I've cleaned off the rust and painted it. Now I have a bunch of rusty steel accumulated on deck. The realisation that it's easier to prevent the rust in the first place, so far as is reasonably possible, has finally dawned. 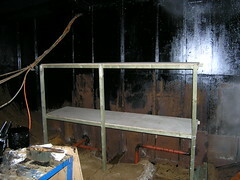 The picture shows new steel plate, recently delivered, now covered with a fresh coat of primer. This primer is a departure from the other coatings I've been trying. It is the same stuff the steel merchants themselves use. I figure that if it's good enough for them, it should be good enough for me. If this works out well, I'll have to see what it costs to buy new steel which has been shot blasted and primed at the mill. By the way, the title for this post was prompted by this article by John Kretschmer. There remains a myriad of bits and pieces I'm trying to get done before Lady Jane leaves the yard at Fareham. 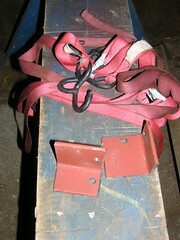 Here you see the brackets and straps for securing the batteries. Right now the line of 12 big 2 volt batteries, which comprise my 24 volt battery bank, are not really secured at all. I know it's only a short trip round to the River Itchen, in Southampton, from Fareham, but it would not be a good thing to have those big old lead/acid batteries sliding about the fiddley deck in the event we get a big swell or something. All it now needs is a bzzzt or two of the welder and the brackets will be in place. The straps will then ensure the batteries are kept snug in their place. The first of the holes in the deckhead have now been repaired. After investigation, it transpires that the holes in the deckhead all correspond to where the forward railings are welded to the deck. It also appears that, for some reason, the railings have been moved back from the edge at some point, so one or two of the leaks in the deckhead appear to be from the spot where the rails used to welded to the deck. You can see in the picture that we, and by we I really mean Robin, have cut the rusted steel out completely and welded new plate back in. The deck rails have also been welded back on top of an 8mm thick 'footing'. If the railings get a knock for any reason, this will help absorb any impact and help prevent cracking, or tearing, the underlying steel. This is the first of eight that have to be done. It also occurs to me that I should check the height of the rails against current MCA codes of practice (1 metre I believe), as I may as well address this issue seeing as I have to cut and weld all of the supports anyway. Rob, I may even give straightening some of those bent rails a go at the same time. Work has started on fixing the holes up in Lady Jane's bow. Robin needed no encouragement to cut a massive section out of the side of the bow. You can see him embarking on cutting yet more out in the inset. 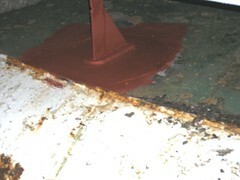 This gives you an idea of just how much steel was rusted paper thin by those relatively small leaks in the deckhead. It looks worse than it really is, as with Robin's deft welding, and the help of some chain blocks, some newly cut and primed sheet steel should slot straight in there as soon as this wet, windy weather leaves us. There are still a few small holes elsewhere on the port bow to take care of, but this patch will have the worst of them fixed. 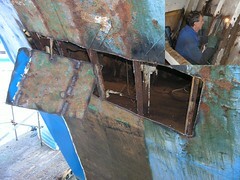 The leaks in the deckhead are also being fixed, as it's pointless fixing the holes but not the cause of the holes. 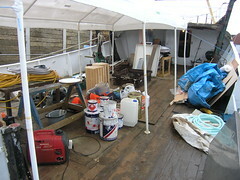 Once this lot is done, there is still the starboard side to take care of. Well that's another skip load gone off of Lady Jane. 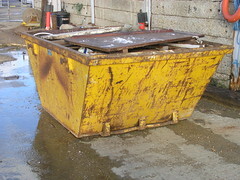 Thanks to Adams Waste in Fareham (Phone 01489-581736) who have always provided an excellent service - prompt and friendly. That must make it the fourth or fifth load, plus all the stuff I've trucked away myself. It does seem a little odd me chucking away all this stuff, when I'm also trying to get the bow down with more ballast. The reality is that the stuff in the skip is old rust,smelly old timbers and other junk that I simply have no place for on the boat, so off it goes to a landfill somewhere. I am idly curious as to what Lady Jane now weighs, so I have an idea of the total weight of just how much I've been responsible for clearing out from throughought the boat. By the way I, and others, have ached after carting the stuff about over the last two years, I bet it's lots. 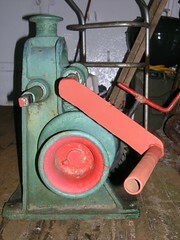 I've started work on getting the anchor winch sorted out. The immediate problem being the gypsy is supposed to be able to turn independently of the warping drums, but they are currently seized together. A second, but related, issue is that the key which is supposed to allow the gypsy to engage/disengage is also jammed. I've tried the gentle application of heat to burn off the paint, which initially seemed to be the cause of the problem, though now it appears the main parts are rusted together and so more drastic measures need to be employed. The key is brass (soft) and the rest of the winch is cast (brittle), so it's not just a case of banging away at the thing with progressively bigger and bigger hammers. Anyway, to make my life easier I've welded myself up a new handle, which you can see in the picture. At least I can now crank the thing over easily enough. The plan is that the winch will ultimately be powered by a 24v electric motor, though I'm hoping the handle will enable my anchor to be lifted by hand, and therefore be useful as a standby in the longer term. I had originally planned for the handle to be longer, to make life easier, but the winch itself would need to be mounted higher for a longer handle be usable without causing some sort of back injury, or scraping one's knuckles on the deck for that matter. A compass is a basic requirement on Lady Jane, however I'm discovering that this compass business is a little more tricky than you would think. 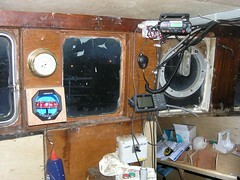 Here you see the current state of the wheelhouse, with my new compass now mounted there on the left, the inset, in the bottom right, shows the making of the bracket. The thing with putting a compass into a steel boat is that it doesn't necessarily point north. There are small adjustment magnets which need to be fiddled with to compensate for all the steel about, and so get the compass pointing north as it should. Because Lady Jane is not ready to go to sea, I can only set the compass up for a north/south orientation (she happens to be pointing north). I'm told a similar alignment needs to be done on an east/west bearing, then compensate on the north/south and so on until the compass is as accurate as possible. Before gps, this was presumably done by professionals using a gyro compass, which once oriented correctly would stay accurate, as the gyros would keep the compass pointing north correctly regardless of any magnetic influence. I'm hoping that when I move Lady Jane round to the Itchen I'll have the chance to set my compass up using the gps for the right orientation. If that fails I'll have to get someone in to 'swing' my compass for me. Oh yes, I know there is a big bunch of wires sticking out all over the place in that picture. I've still got more instrumentation to mount, and the compass internal light to wire up, then this should all get tidied away. As many of you are aware, Lady Jane is currently alongside the Lafarge quay in Fareham. Over the last few years the relationship has been pretty good, with my presence there being of mutual benefit. Amongst other things, I've sort of acted as a night/weekend watchman when working at the Lafarge yard. The fact that there has not been any theft or vandalism outside of hours is, I believe, evidence that my presence must be doing some good. You would think that if the Lafarge management wanted me gone soonest, nobody at Lafarge would take any action to hinder my progress. The big project in the forward hold will be installing an anchor system. I've got a big enough looking anchor, which I've had on board since buying Lady Jane, and recently bought a winch on eBay. 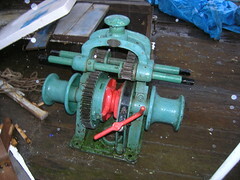 The winch is in reasonable condition, a little worn, with one tooth broken, but it looks perfectly serviceable. I'll have to do some more work on the winch, as the internal mechanism has been painted so the parts don't move independently of each other. The gypsy, the red bit in the middle that the chain runs through, should run independently of the warping drums on either side. I also need to find myself some chain to complete the set. Finding chain will start by measuring the gypsy, to see what size I'll need, then the hunt will be on. A wise person would buy a short length of chain, as a test before committing to buying a proper length of chain, as it's sold by the metre and is pretty expensive stuff. There are two main tasks to perform in the forward hold. The first task is to fix the holes in the sides, both port and starboard, then to install the anchor system. Pretty much since buying Lady Jane I had assumed the holes in the sides were as a result of the steel corroding from the outside. Now, having removed everything, including the shelving, from the hold, it's obvious the holes in the sides are a direct result of small holes in the deckhead. You can see this quite clearly in the picture. 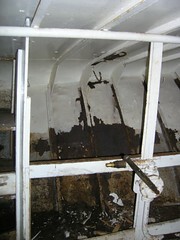 As has happened in the stern accommodation space, water seeping down from elsewhere has rusted the steel from the inside. In this case, it appears the holes which have caused the rust are the result of a leaking weld on some overplating, which must have been done some time ago. The wooden shelves, and piles of junk, simply helped to mask the problem. Overplating is where a new piece of steel is laid over a problem area and welded into place, as opposed to cutting out the old, rusty, steel back to good steel, and welding in a patch of new steel which has been cut to the size of the hole. Before we can fix the holes in the sides, the holes in the deckhead need to be addressed. This picture, taken shortly after I started work, gives you an idea of the enormity of the task of moving the stuff from the forward hold to the fish hold. I moved out all I could from up forwards, until the deck was so full I could hardly move, then, with Fred's help packing, I lowered everything into the fish hold, piece by piece. Fortunately the rain held off, so pretty much everything was moved dry. There are a few bits and pieces still to move, as I ran out of time, but the job is effectively done. Oh yes, and my muscles all ache! Now that I've abandoned painting in the fish hold, work elsewhere can commence. The first step has been to put temporary shelves into the hold, to help provide more space for the stuff that I've been accumulating in that forward hold on Lady Jane. I could have put in much more, but this is only supposed to be temporary. Also, this way that's at least that's another thing easily crossed off the list. Shifting all my junk down into the fish hold is not a task for the faint hearted. That's years worth of stuff accumulated, too useless to be of use but too valuable to throw away. The really sad bit is that once all the refurbishment in the forward hold is complete, this stuff will all have to be shifted back in there. I'll probably have even more junk by then, as there is plenty of work to do in that forward hold. Just a quick post to wish everyone a happy and prosperous 2007. I've had a bit of a break from dear old Lady Jane, mainly on account of the cold, wet and windy weather, but it's now time to get back to it. I've had to abandon the painting in the fish hold for now, on account of it just taking far too long. My next step will be to clear out the forward hold, in preparation for getting the required cutting and welding done up forwards.